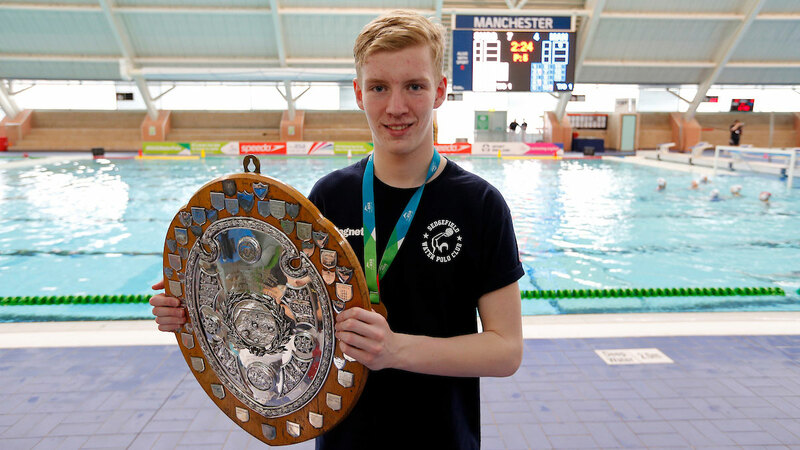 Sedgefield defended their Boys’ U17 ASA National Age Group Championship title after a feisty encounter against North East rivals City of Sheffield. While there was little to choose between the two teams through the first half, a red card for brutality for Sheffield’s Dan Hunt in the third quarter halted their momentum and Sedgefield took advantage to secure a 15-7 (3-2, 1-2, 4-0, 7-3) win. We seemed to pull away a bit more in the second half – I think that was a result of our fitness and general ability. Victory completed a perfect season for Sedgefield, who had held a 100 per cent record from both the Preliminary and Qualification Rounds of this year’s tournament before seeing off eventual bronze medallists Caledonia 12-10 in yesterday’s semi finals. And Sedgefield captain Michael Cousins, who led the scoring for his side with six in the final, was adamant his side would have finished on top, even without their four-minute player advantage after the red card. “The red card had a big impact because he [Hunt] was one of their biggest threats but we were ahead in the game anyway,” said Cousins. “It was quite a close game in the first half but then we seemed to pull away a bit more in the second half. I think that was a result of our fitness and general ability. While Cousins scored six, Sedgefield’s Ben Stephenson was also heavily involved, causing trouble in the pit throughout the game and helping himself to five goals. And it was Stephenson who started the ball rolling for the defending champions in the opening quarter, netting twice before Cousins bagged his first of the game for an early 3-0 advantage. But City of Sheffield kept their heads and carved a way back into the game with goals from Connor Carpenter and Jacob Skelton before the first interval. Sheffield held the lead in the second quarter as Skelton’s second and a goal from Hunt moved them 4-3 ahead before Cousins levelled proceedings again. Both goalkeepers impressed as the second quarter wound to a close; firstly Sedgefield’s Richard Murray making a double save at his near post before his opposite number Will Mardlin smothered Cousins’s shot from 3m at the other end. Sedgefield started the third quarter the stronger as Cousins scored twice to edge his side clear, then Stephenson showed impressive strength to hold his ground and scoop a backhand into the net. An unsavoury coming together between Hunt and Sedgefield’s Kris Egginton left both players leaving the field midway through the third; Egginton with a bloodied nose and Hunt with a red-card to his name for brutality, leaving Sheffield on man-down for four minutes. Finn Parnell scored the resulting penalty for Sedgefield to leave them 8-4 up with eight minutes to go and with one hand on the trophy. Early fourth quarter goals from Parnell and Stephenson put Sedgefield even further ahead but, to their credit, City of Sheffield did not let their heads drop and fought hard to claw their way back into the game. Oscar Kelly scored their first goal since the second quarter to make the score 13-5 while Arshia Keyghobadi scored either side of a Cousins goal to make it 14-7. But it was Sedgefield who were to have the last laugh with Connor Keeble’s goal with a minute on the clock sealing the win. Caledonia defeated City of Manchester to win the bronze medal in a 36-goal thriller. The Scottish outfit, who came so close to denying Sedgefield in yesterday’s 12-10 semi final defeat, led 12-8 at half-time before pulling clear in the third and fourth periods to secure a 22-14 win.